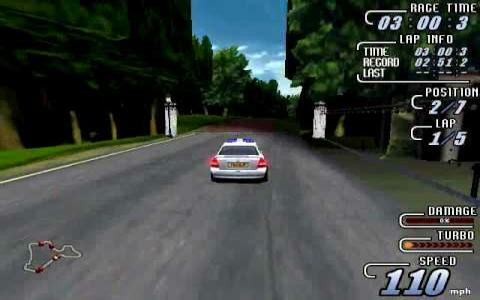 There's a number of games in the London Racer series including Police Madness, and while they're far from classics, they do make for cheap and cheerful entertainment. This one is very much in the Burnout mode, and focuses much more on causing as much mayhem as possible, rather than outright racing, but it remains quite an enjoyable, if somewhat simple, experience. You're given a fairly large playground, covering twelve different environments spread across ten European countries, and with each type of environment having five separate tracks. Whichever environment or country you're in, your basic goal is to take part in various races but rather than just completing them in first place, you're really trying to stop your opponents from ever seeing the finish line. You've got access to a range of weaponry to help you out in this, as well as powerups to improve your car, while there's a total of nineteen vehicles to unlock throughout the game. There's a detailed damage model, with your car showing all the results of your actions, while roadside objects can also be destroyed. While Destruction Madness is certainly not complicated, it is a lot of fun, at least for the first few plays. There's a good sense of speed, the game is very easy to pick up and provides some genuine thrills, with a lot of fun to be had just trying to wreck stuff. There's a good number of cars and tracks too and which are varied enough to maintain interest in the short term, but the lack of depth does show over extended play, so don't expect this to keep you going forever.